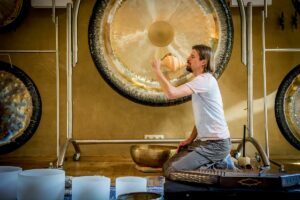 Tom has been working with Gongs, Singing Bowl Massage and Archaic instruments since 2001, when he began collaborating with Gong Master Don Conreaux during his first visits to Europe. Later Tom took his own intuitive direction studying the knowledge from the Himalayas (Nepal and India) and combining the knowledge he learned over the years to provide rich in depth teachings. Founder of Tone of Life ( Art for Peace) created in 2002 to deliver new possibilities and techniques to work and help people through sound. Since 2002 Tom has been instrumental in introducing Sound Massage with Himalayan Singing Bowls, Gong Teachings and Sacred Tone Improvisation with Archaic Sounds to many countries in Europe (Poland, Slovakia, Hungary, Czech Republic, Lithuania, Latvia, Estonia, Portugal, Spain, Italy, Slovenia, Croatia, Austria, Ukraine, Russia, Sweden) as well as Emirates, Australia, New Zealand, China, India, Argentina and Urugway. In 2005 he discovered and began to teach Singing Bowl Massage in the Water, which quickly became very popular all over the world. In 2006 Tone of Life team created Maitreyan Peace Celebration Gongs and next years with his partner several new types of the Gongs, known also as 4 Elements that are now used extensively in Gong therapy. In 2006 Tom opened the first Peace Bell Garden in Krakow and in 2010 the second in Porabka at his ‘Sound of Nature’ retreat centre. In 2012 together with his wife Abby they lead a project to play the Gong for Southern Wright Whales in the town of Puerto Piramides on the Peninsula de Valdes in Argentina. As a Musician, Tom provides Concerts of expansive, meditative and trance music all over the world, using Gongs, voice and instruments from different part of the Universe. He has also made soundtracks and live acts for Theatre plays. Tom has recorded 8 CD’s with musicians from all around the world and Solfeggio Frequencies. He has dedicated his life to Sacred Tone Improvisation, helping and inspiring people from around the world to find the way to their heart.